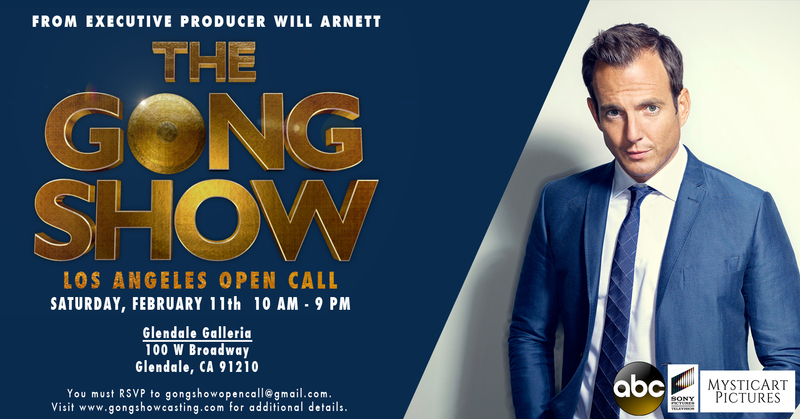 Open Casting Call Auditions for ABC’s “Gong Show” Revival in L.A. Talent Search for ABC’s THE GONG SHOW! The award-winning casting company MysticArt Pictures is searching the nation for zany, creative, and talented acts for THE GONG SHOW! The iconic variety show will be executive produced by Will Arnett and Sony Television for ABC! MysticArt Pictures will be holding an OPEN CASTING CALL on Saturday, February 11th at the Glendale Galleria. Reserve your spot now before the VIP slots are filled! VIP slots ensure you priority access to meet the Gong Show talent producing team. The Gong Show will be a once in a lifetime opportunity to perform your unique and memorable act on primetime television for a panel of celebrity judges and America. Prepare a 60 – 90 second act for the chance to land a spot on THE GONG SHOW! RSVP at gongshowopencall@gmail.com to get VIP access. THE GONG SHOW is unlike any other show on television; on this stage, ANYTHING goes! We’re looking for performers who want to show off their wonderfully unpredictable, one-of-a-kind, and original acts on America’s greatest variety show and the biggest party on television. You can find more information at www.gongshowcasting.com. We are shooting in Los Angeles in Spring 2017 and we are booking slots for our open call very quickly! If you or anyone you know would love to attend our OPEN CALL AUDITIONS, please make sure you reserve your spot ASAP! This open call will be on Saturday, February 11th at the Glendale Galleria from 10am-9pm.